Our Doodle puppies are born in the main part of our house and raised in the kitchen or den area. Their eyes open by two weeks of age. By four weeks old we are able to begin understanding each pup’s temperament. Between 4 and 5 weeks of age we allow the puppies short periods of play time outside in the back yard. At 7 weeks of age each pup is temperament tested by an experienced dog trainer. We use the world-renowned Volhard Temperament Test, the same test used on potential guide dogs, military/police dogs, drug dogs and sport dogs. We have a good idea of each pup’s core temperament after the test. 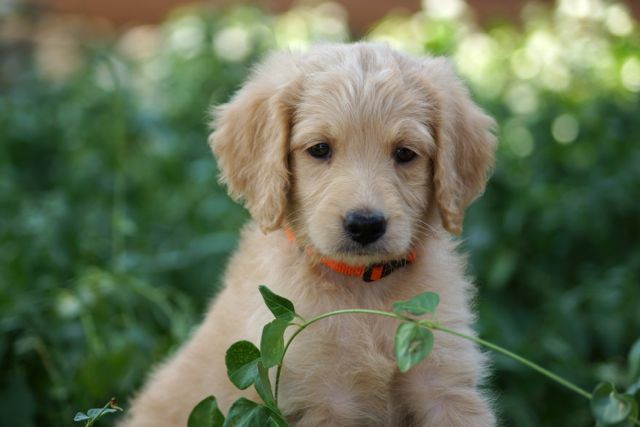 The test scores, plus our experiences with each puppy, help us guide buyers to their perfect companion. As our pups grow we do stress tests. We follow traditional Early Neurological Stimulation protocol. Starting from birth we handle the litter each day. Puppies are placed on a variety of different surfaces, textures and temperatures (in moderation, of course) before their eyes ever open. Research has proven that the more a puppy’s brain absorbs from birth to 16 weeks, the stronger they are both emotionally and physically. In fact, some scientist believe that early ‘stressing’ of pups actually prevents disease later in life. Starting at six weeks of age we take nature walks in our very large fenced yard with mom and her litter on the farm. Through the fence they see the horses, cows, the cats, the birds, and jump, leap and enjoy the outdoors. This accomplishes two things: It teaches the Doodle puppies that people are to be followed, plus it develops motor skills and acceptance of “the big scary world”. Safari Doodles puppies meet a variety of adult dogs of all ages and sizes; we are quite careful to only expose them to animals and environments that we know are free from disease. All pups learn to climb stairs and love to run in and out of the doggy door. To top this all off we begin training the pups at six weeks. Our puppies learn to come when they are called, use a doggy door and eliminate in a litter box. Plus the pups are also imprinted to playing ball and tug, and ‘no-bite’. Through this extensive socialization and training we hope to produce a pup that adjusts quickly to your home, making your life just a little bit easier.